Last night the Israel Defence Forces (IDF) took the highly unusual step of announcing that they were engaged in a large-scale attack on Iranian targets in Syria. In previous years Israel has kept silent about such attacks, but that policy has clearly changed. The IDF later explained that they launched the attack in retaliation for a surface-to-surface missile that was fired towards the northern Golan Heights. That incoming missile was shot down by Israel’s Iron Dome defence system. The Syrian Observatory for Human Rights (SOHR) said that the Israeli strikes were the most significant in Syria since May 2018. The Syrian state news agency quoted a military source who claimed that Syrian air defences “prevented Israeli air strikes from achieving their objectives in the south.” A typical claim in such circumstances. And that claim was supported by Russia’s defence control centre, which claimed that Syrian military air defences destroyed more than 30 cruise missiles and guided bombs during the Israeli air strikes. Presumably this was of interest to the Russians because they supplied those air defence systems. However, according to the UK-based SOHR, 11 people were killed in Syria during the air strikes, which hit targets around the Syrian capital, Damascus, including some at its airport. That report seems much in line with statements from the IDF. The IDF also struck a number of Syrian air defence targets, which had fired at the Israeli jets despite a warning from the IDF not to do so. 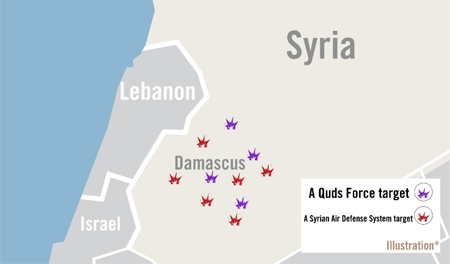 The Israelis often seem to give the Syrians the option of avoiding damage. So now the world waits to see just how impatient they are to attempt that. On Tuesday the SOHR reported that the death toll from Israel’s air strikes had risen from 11 to 21, including at least 12 members of Iran’s Revolutionary Guard. Six of the casualties were confirmed members of the Syrian regime and pro-Syrian armed forces, while the other 15 were deemed to be foreign nationals.